I hope this note finds you enjoying our spring showers and able to catch your breath between weekends. Amador Council of Tourism’s Board of Directors meets next Thursday, May 14th, 9 am, Jackson Rancheria Casino Resort hotel. All are welcome. Please arrive early to enjoy the wonderful food and beverages, generously provided by Jackson Rancheria Casino Resort. 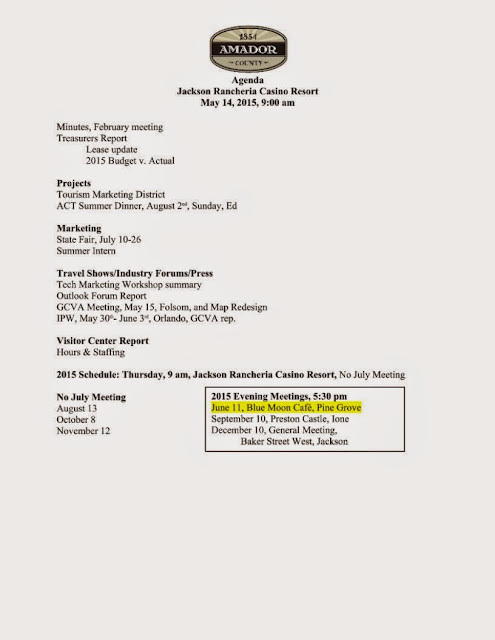 Please allow 1-1/2 hours for the meeting; we cover the agenda in an hour, and then hear from each attendee about their business or organization. All of us are busy, and I promise your time will be well-spent at our meeting. The last two items were sent in previous emails. I bring them to your attention as great opportunities to promote your business, with the branded platform that Amador Council of Tourism provides. If you are considering participation in the State Fair booth, we need to receive a sample of your materials to be handed out at State Fair by June 10th. We are required to submit all promotional material to State Fair in advance, and they have right of refusal. This week we sent out a letter to our list of State Fair Volunteers, about volunteering for State Fair and have received many enthusiastic responses. Thank you. If you did not receive the letter and wish to volunteer, please let us know. Please do not hesitate to contact us with any questions, suggestions, concerns. Any of the volunteers here at the office or Rebecca Brown, Administrative Assistant, can help you. 2015 State Fair Support Letter. 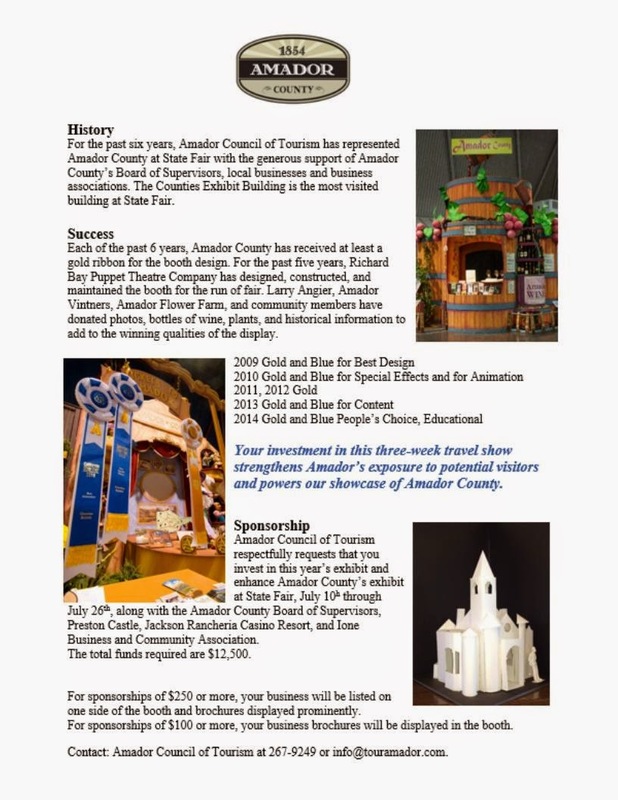 Amador Council of Tourism is planning a County Exhibit booth modeled on Preston Castle. Read our letter for details. Capital Public Radio is offering two different opportunities. One program needs six partners and the other requires a mix of nine. 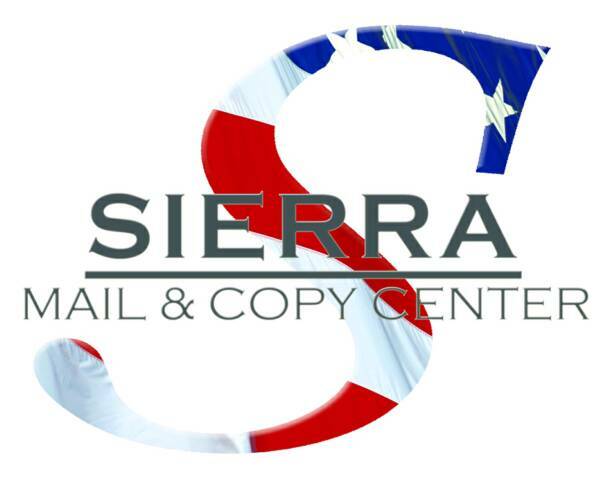 Please review the following documents, Amador_Merchants_2015.cpr and Amador_Merchants_2015_High.cpr, and contact Paul Adams directly by email or phone. His email is: paul.adams@csus.edu. Phone is 916-995-8801. Folsom Lake Entertainer has an inexpensive option, which is part of a spread supported by Amador Council of Tourism. The magazine is part of Gold Country Media, and is distributed monthly in their papers and on stands throughout the See attached pdf called ‘Amador County Share.fle.pdf’. If this works for your business, please contact Jennifer Herndon. Email is: jherndon@goldcountrymedia.com. Phone is 916-351-3750. Sactown Magazine is published every other month and has proposed an Amador Travel Planner insert. With enough involvement, this can be very impactful. Please contact Lisa Bonk. See ‘Sactown One Sheet and Mock-Up for special section2015’ for details. Email is lisa@sactownmag.com and phone is 917-647-6775. Sacramento Magazine is published monthly and has a similar shared page to Folsom Lake Entertainer. They offer various prices and sizes. Amador County One Sheet Pricing.sacramento is the document to review for details. Dennis Rainey is the contact. Email is dennis@sacmag.com and phone is 916-351-3750. Gold Country Partners: Calaveras and El Dorado are working with Amador to have a strong presence in the Magazine called ‘Touring & Tasting.’ Please read the note below for details and contact Paul with any questions. The national wine/food/travel publication Touring & Tasting is producing a special section next issue with a working title of “Visit Gold Country.” This is going to be an expanded section that covers multiple counties: El Dorado, Amador and Calaveras. Each of the tourism entities in each county has committed to purchasing space and thereby reducing the cost for business who also want to participate. 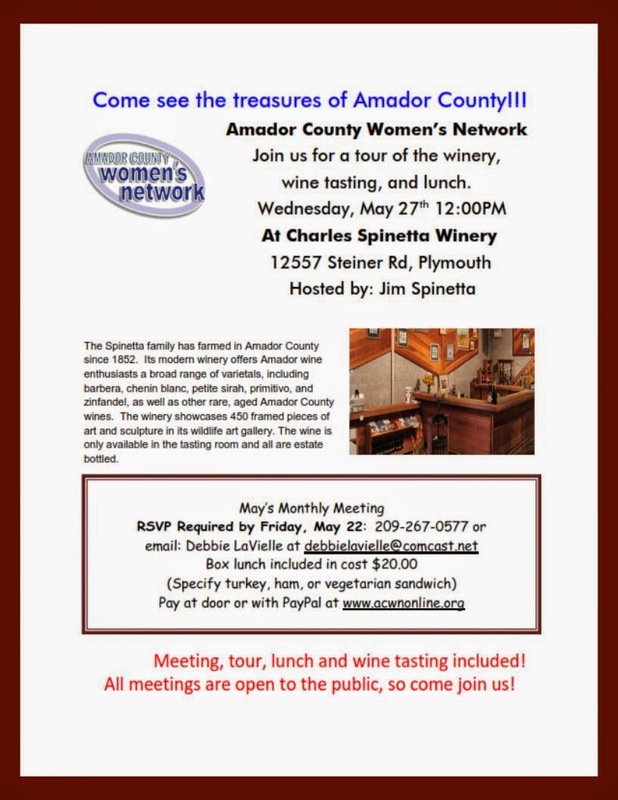 This special section will include map pages and a 2 or 3 page introduction (provided by Touring & Tasting) giving visitors the many good reasons for visiting the region: historical places to visit, things to do with the family, restaurant recommendations, places to stay…and of course our recommended list of wineries to visit. Businesses can be featured with their own article in half-page or one page formats. In addition, Touring & Tasting has multiple direct to consumer wine channels and is interested in purchasing Amador County wine thereby making winery participation much more economical. If you are interested in the program and would like further information, please contact Paul Arganbright at paul@touringandtasting.com. Can you contribute to SBC on a day when your donation will go further? We want to graciously remind you that May 5th is the BIG Day of Giving. Rather than doing a twice-yearly mailing ask, SBC is going electronic and asking you to participate in this huge and historic event for our region. On the BIG Day of Giving, each donation is matched on a prorated basis, making every gift go farther. Your donation of any amount will help SBC continue to foster thriving communities and a healthy environment in the Sierra Nevada, two things we can all agree are of huge value. Check out our staff videos below where we tell you what SBC means to us, and why we think it's an organization worth your contribution. What is SBC to You? Alicia discusses the benefits of SBC programs on local economies. Kristin delves into how SBC's work encourages a regenerative economy that can sustain the region. Bowen describes how SBC's interdisciplinary strategies lead to novel solutions for the Sierra's toughest issues. Thank you for your time and consideration, we hope you'll join us on the BIG Day of Giving, May 5th with a donation to SBC. Thanks for reading, and don't forget to join us on Facebook or Twitter for up-to-the-minute updates! May Chamber Mixer at 5:30 pm on 5-13-15 at the Holiday Inn Express in Jackson........Bring a raffle prize to promote your business!! You are cordially invited to participate in the Annual Amador County Chamber of Commerce Golf Tournament, May 22, 2015. 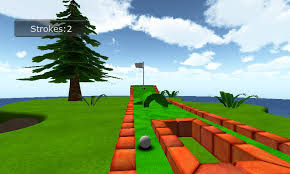 Entry fee is $75.00 includes 18 Holes with BBQ steak sandwich dinner, Golf Cart, Range-Balls and Prizes. Sign up now for Golf and Sponsorships. Contact the Chamber for more details.